Sidebar: "Pliny the Elder was a Roman naturalist, scholar, historian, traveler, officer, and writer. Although not considered his most important work, Pliny and his contemporaries created the botanical name for hops, "Lupus Salictarius", meaning �wolf among scrubs." Hops at that time grew wild among willows, much like a wolf in the forest. Later the current botanical name, Humulus Lupulus, was adopted. Pliny died in 79 AD while observing the eruption of Mount Vesuvius." This beer is a clone of Russian River's Pliny the Elder Double IPA. Why clone a random DIPA from CA? Well, here's the story in brief. This beer has quite a cult follow and good reputation on BeerAdvocate.com. So after reading many reviews, hearing many stories, and seeing it creep its way up the Top 100 to number 28 I decided I NEEDED some. The problem is that this beer is only available on tap, so I needed a kind individual from CA to mail me a growler - great, like that's going to happen. Anyway, I took a chance and posted asking for any kind souls to do just that. About two weeks later a very generous individual named wezil offered to set up a trade with me. Well back in April I posted this post about Pliny based from this trade. Also, remember if you may back in February I posted this post about winning in the B3 contest, and that one of the prizes happen to be two free B3 kits with yeast. And guess who B3 happens to be boys with? You guessed it, Vinnie Cilurzio of Russian River Brewing Company. So, one of the kits I chose, based off of the BeerAdvocate.com reviews, my personal experience trading and tasting the beer, and having a winning opportunity to make this beer for free, was the Pliny the Elder Double IPA kit. 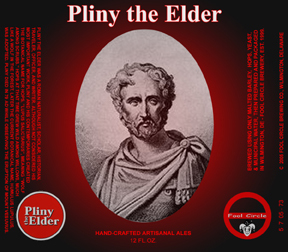 Hey, notice anything about the picture for Pliny the Elder on BeerAdvocate.com? No, well that's the same picture as from the Fool Circle post about Pliny only with the back round Photo Shopped out, sweet! Russian River also makes another beer named Pliny the Younger which is a triple IPA. Pliny the Younger is hopped three times more than their standard IPA, and is dry hopped four different times, WTF!! I've heard of other homebrewers trying to replicate this tyle of beer and naming their beers such things as "Pliny the Unwanted" and "Pliny the Red-Headed-Step-Child." My Pliny the Elder clone is a humongously hopped beer with over a pound of hops in the recipe and a huge 7 ozs. of hops to dry hop a 5 gallon batch! Literally, this beer is green in the secondary fermenter and it was brewed about two months ago. Okaly-dokaly, as someone's kind neighbor might say. This beer is awesome. I thought it was going to be way more over the top and rip your face off, but it is just one REALLY nice DIPA right now. Obviously, since a large chunk of the hops were late addition the hop end leans to overwehlming aroma nd mad crazy flavor with a very controlled bitterness. I would say that this beer, though designed by Vinnie himself from Russian River, misses the mark on the Pliny the Elder I remember. Pliny to me was more, OMFG than this beer is. This beer is more, ... WTF! Make sense? Than you spend too much time on the computer too, just ask SWMBO!